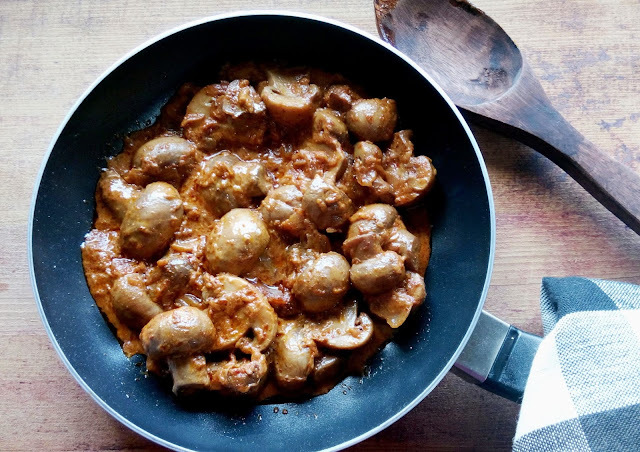 A favourite in my kitchen,Mushroom masala is easily the fastest and most delicious way of using mushrooms. Button mushrooms are always stocked up in my freezer.I love to use them in pizzas and pastas and salads and this yummy dish.This is my mothers recipe which has been modified by me to make it more flavoursome.I have added milk to give it a more creamy texture.Milk can be replaced by low fat cream too. This is one comfort food which I go back to often. Take a pressure cooker,add mushrooms and water to it.Keep it on high heat.After two whistles take it off heat. Remove all water from cooker and pour mushrooms in cold water to stop cooking. Take a frying pan,add vegetable oil to it.Add onion paste and saute it till its brown in colour.Add ginger garlic paste and saute it till raw smell of garlic goes away. 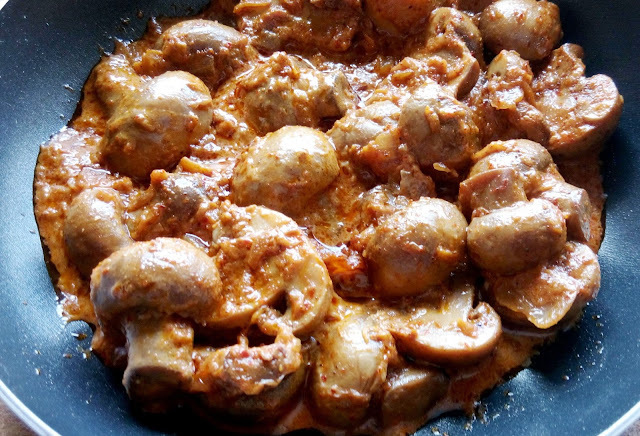 Add red chilli powder followed by water and mushrooms.Stir well and let it cook for 2 minutes.Now add garam masala and salt ,stir well and let it cook on high heat till it comes to boil. Lower the heat and add milk to the pan.Stir well and let it cook till you get desired creamy consistency. Thank you.Hope you enjoy making it!